The public is divided over the not guilty verdict in the George Zimmerman trial and over the conversation about race that has surrounded it. The latest national survey by the Pew Research Center, conducted July 17-21 among 1,480 adults nationwide finds roughly as many satisfied with the verdict in the case (39%) as dissatisfied (42%), with nearly one-in-five (19%) offering no opinion. More broadly, 52% say race is getting more attention in this case than it deserves, while 36% say the case raises important issues about race that need to be discussed. African Americans express a clear and strong reaction to the case and its meaning: By an 86% to 5% margin, blacks are dissatisfied with Zimmerman’s acquittal in the death of Trayvon Martin. And nearly eight-in-ten blacks (78%) s ay the case raises important issues about race that need to be discussed. Among whites, more are satisfied (49%) than dissatisfied (30%) with the outcome of the Zimmerman trial. Just 28% of whites say the case raises important issues about race, while twice as many (60%) say the issue of race is getting more attention than it deserves. Not only do reactions to the outcome of the case vary widely across racial lines, but overall interest levels also are very different. When asked, in a separate survey, what recent news story they are talking about with friends and family, 63% of blacks volunteer the Zimmerman trial compared with 42% of whites. Nearly six-in-ten African Americans (58%) say they followed news about the verdict and reactions to the case very closely compared with 34% of whites. To be sure, some of this reflects the higher share of minorities among younger age groups. But there are sizable age differences in whites’ reactions to the verdict. Among whites younger than 30, as many are satisfied (39%) as dissatisfied (41%) with the Zimmerman verdict. Among whites 50 and older, majorities are satisfied with the verdict (57% of those 50-64, 56% of those 65 and older). 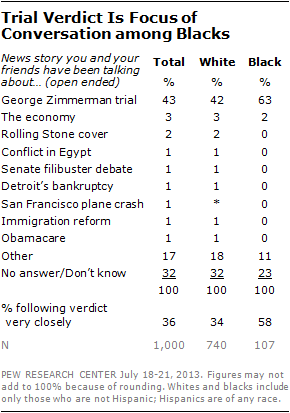 Reactions to the Zimmerman verdict are deeply split along partisan lines. A majority of Republicans (61%) express satisfaction with the verdict, compared with 42% of independents and just 22% of Democrats. Partisan differences are nearly as stark among whites: White Republicans are about twice as likely as white Democrats to be satisfied with the verdict (65% vs. 30%). Tea Party Republicans have an especially positive reaction to the verdict in Zimmerman’s trial. Fully 80% of Republicans and Republican-leaning independents who agree with the Tea Party are satisfied with the verdict, compared with 51% of Republicans and leaners who do not agree with the Tea Party. W hile most white Democrats are unhappy with the verdict, dissatisfaction with the outcome is much broader among black Democrats (91% dissatisfied) than among white Democrats (56% dissatisfied). There also are gender differences in opinions about the Zimmerman verdict. More men are satisfied (44%) than dissatisfied (36%) with the trial’s outcome while women, on balance, are more dissatisfied (48% dissatisfied vs. 35% satisfied). These differences are evident even when the respondent’s race is taken into account. About half (52%) of Americans say the issue of race is getting too much attention in this case, while 36% say the case raises important issues about race that need to be discussed. Roughly three-quarters (78%) of blacks say a discussion of race is important, compared with 47% of Hispanics and just 28% of whites. (See the table at the end of this report for a detailed look at opinions about whether the case raises important issue about race that need to be discussed). 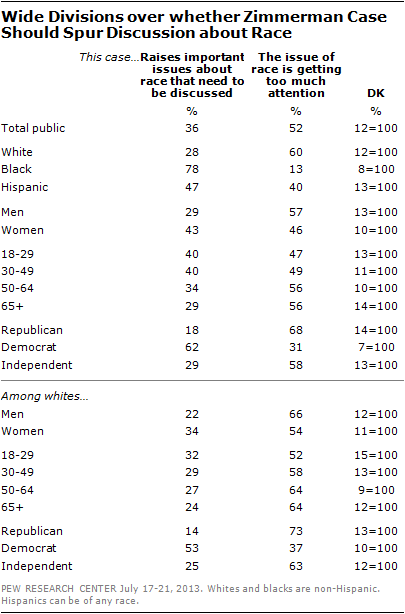 There is a substantial gender divide in views of race and the Zimmerman case. By nearly two-to-one (57%-29%) men say the issue of race is getting too much attention. But women are evenly divided: 43% say the case raises important issues about race that need to be discussed, while 46% say race is getting too much attention. Most Democrats (62%) say race is an important issue in the case that should be discussed. This is also the view of a smaller majority (53%) of white Democrats. Just 18% of Republicans say the case raises important issues about race that merit further discussion while 68% say the issue of race is getting more attention than it deserves.